Three years ago last April I withdrew my five-year old son from school. Although I knew I’d done the right thing, I was as terrified as I was excited about the prospect of homeschooling. I remember waiting in the playground one day, collecting my daughter who was then still at school. My friend Kathy asked where J(5) was. I had to repeat my mumbled words four times before Kathy could hear me say, “I’ve decided to home-educate him,” I was so reluctant to declare what I was doing out loud! These days I sing from rooftops about our joyful homeschooling life. If I could go back and give my younger self – the terrified me in the school playground that day – three pieces of advice, this is what they’d be. J(5) was in the top sets at a very academic private school, so as soon as I pulled him out I began worrying that I needed to keep up with the exact same phonics, handwriting and maths programmes he’d been following at school – otherwise, surely I’d be failing him? But you just can’t compare school with the education a child gets at home. Finding the right homeschooling approach for your family takes time. Don’t stress about your child getting behind. 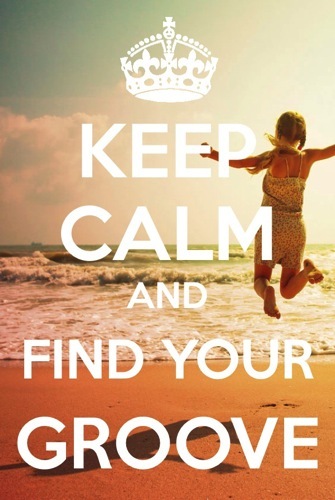 Give yourselves time to find your homeschooling feet. God willing, your child has eighty or so productive years ahead of him. Isn’t it worth investing a few months to create the optimal learning environment for him? 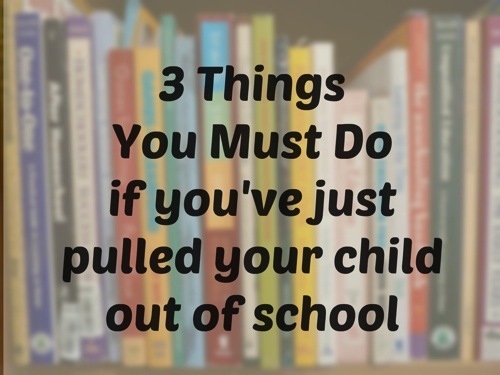 To distract you from worrying about what your child is or isn’t learning while you’re finding your homeschool groove, focus for a while on educating yourself. There are many different ways of homeschooling and it will take time and experience to find the style that suits your family best. You can make a good start by reading about the different approaches. My original homeschooling philosophy was unschooling, a style we’ve now come back to. But that doesn’t mean I regret any of the time I spent researching classical homeschooling, Charlotte Mason, project-based homeschooling or any of the other wonderful homeschooling methods available. Successful homeschoolers take the best bits of lots of different styles and adapt them to suit their own families’ needs. I’ve picked up more practical homeschooling tips from reading other homeschoolers’ blogs than from everywhere else put together. From experienced veterans to mums who are just starting out, everyone has something to offer. If at all possible, meet a few real life homeschoolers in your area. When we started out we tried several local homeschool groups where both I and the children made lasting friends. The support these women provided in the early days – especially before my husband and extended family were fully on board with homeschooling – was a lifeline. You might also want to join online forums to connect with specialist groups, whether that’s people in your part of the world or homeschoolers dealing with special needs like dyslexia, giftedness or Aspergers. The success of your homeschool will depend, more than anything, on your relationship with your child. Whatever style of homeschooling you end up following, you will be your child’s learning mentor, and successful mentoring requires mutual trust and respect. Use the months after your child leaves school to connect with him, doing things you both enjoy. Play games. Walk in the woods. Read stories or paint together. Quietly observe what he does for fun. You’ll be gathering valuable information about his interests and learning style which will set you up for years of happy and successful homeschooling. Be kind to yourself. You will forget all your good intentions several times a week/day/hour. Auntie Joan will ask how homeschooling’s going and you will panic and give your kids a spelling test. You’ll hear that your son’s old school friends are learning long multiplication and you will cancel the nature documentary you were going to watch together and pull out a maths workbook. You may yell. And cry. And threaten to send him back to school. Give yourself some space. Make a homeschooling toolbox to remind yourself of the positive reasons you took your child out of school. Begin afresh next day. I’m appreciatively linking up with Collage Friday at Homegrown Learners, Weird Unsocialized Homeschoolers’ Weekly Wrap-Up, and the Hip Homeschool Hop. Lula, I just wanted to stop by and thank you for linking up to our blog hop last week. You were chosen as one of our favorite articles and you were featured on this week’s hop! 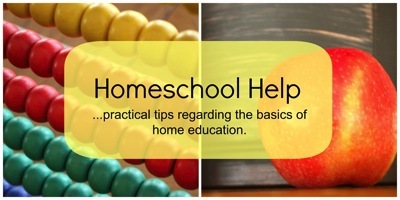 Also, we pinned your article to our New Homeschoolers Board on Pinterest! Hope to see you more at future hops! Thank you so much, Trish – I really appreciate you guys highlighting my post! I love the Hip Homeschool Hop – I’ll definitely be linking up again!